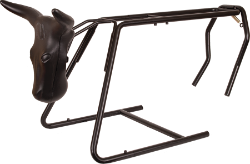 All-Steel Roping Dummy stand collapses down completely flat for ease in shipping and transporting. Steel tubing is powder coated for weather proofing. The hind legs are hinged to the body for a more realistic feel. Metal head plate is universal and will fit most models of roping heads. Head is not included. Assembled stand is 23”H x 43”L. Weighs 17 lbs.